A neuron is a nerve cell that is the basic building block of the nervous system. Neurons are similar to other cells in the human body in a number of ways, but there is one key difference between neurons and other cells. Neurons are specialized to transmit information throughout the body. These highly specialized nerve cells are responsible for communicating information in both chemical and electrical forms. There are also several different types of neurons responsible for different tasks in the human body. Sensory neurons carry information from the sensory receptor cells throughout the body to the brain. Motor neurons transmit information from the brain to the muscles of the body. Interneurons are responsible for communicating information between different neurons in the body. Neurons and other body cells both contain a nucleus that holds genetic information. Neurons and other body cells are surrounded by a membrane that protects the cell. The cell bodies of both cell types contain organelles that support the life of the cell, including mitochondria, Golgi bodies, and cytoplasm. Unlike other body cells, neurons stop reproducing shortly after birth. Because of this, some parts of the brain have more neurons at birth than later in life because neurons die but are not replaced. While neurons do not reproduce in most areas of the brain, research has shown that new connections between neurons form throughout life. Neurogenesis, or the formation of new nerve cells, does occur in some parts of the brain throughout life. Neurons have a membrane that is designed to send information to other cells. The axon and dendrites are specialized structures designed to transmit and receive information. The connections between cells are known as synapses. Neurons release chemicals known as neurotransmitters into these synapses to communicate with other neurons. There are three basic parts of a neuron: the dendrites, the cell body, and the axon. However, all neurons vary somewhat in size, shape, and characteristics depending on the function and role of the neuron. Some neurons have few dendritic branches, while others are highly branched in order to receive a great deal of information. Some neurons have short axons, while others can be quite long. The longest axon in the human body extends from the bottom of the spine to the big toe and averages a length of approximately three feet! How do neurons transmit and receive information? In order for neurons to communicate, they need to transmit information both within the neuron and from one neuron to the next. This process utilizes both electrical signals as well as chemical messengers. 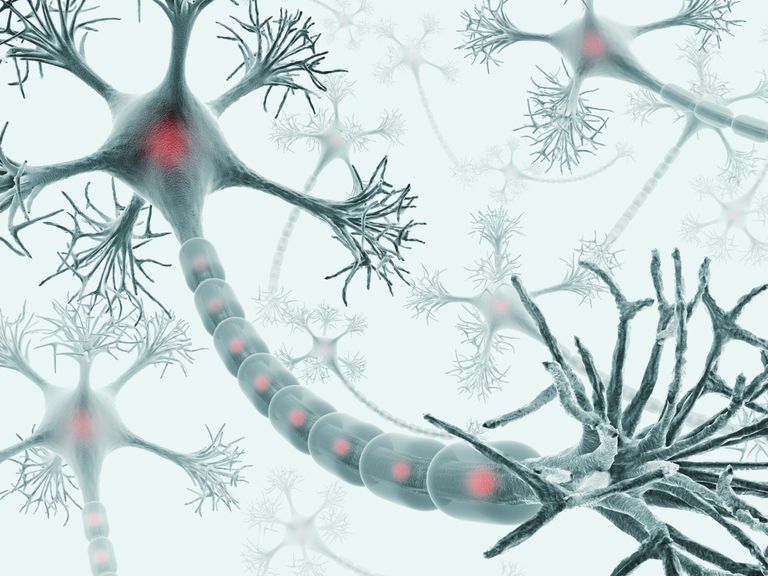 The dendrites of neurons receive information from sensory receptors or other neurons. This information is then passed down to the cell body and on to the axon. Once the information has arrived at the axon, it travels down the length of the axon in the form of an electrical signal known as an action potential. Once an electrical impulse has reached the end of an axon, the information must be transmitted across the synaptic gap to the dendrites of the adjoining neuron. In some cases, the electrical signal can almost instantaneously bridge the gap between the neurons and continue along its path. In other cases, neurotransmitters are needed to send the information from one neuron to the next. Neurotransmitters are chemical messengers that are released from the axon terminals to cross the synaptic gap and reach the receptor sites of other neurons. In a process known as reuptake, these neurotransmitters attach to the receptor site and are reabsorbed by the neuron to be reused. Neurotransmitters are an essential part of our everyday functioning. While it is not known exactly how many neurotransmitters exist, scientists have identified more than 100 of these chemical messengers. What effects does each of these neurotransmitters have on the body? What happens when disease or drugs interfere with these chemical messengers? The following are just a few of the major neurotransmitters, their known effects, and disorders they are associated with. Acetylcholine: Associated with memory, muscle contractions, and learning. A lack of acetylcholine in the brain is associated with Alzheimer’s disease. Endorphins: Associated with emotions and pain perception. The body releases endorphins in response to fear or trauma. These chemical messengers are similar to opiate drugs such as morphine but are significantly stronger. Dopamine: Associated with thought and pleasurable feelings. Parkinson’s disease is one illness associated with deficits in dopamine. Doctors may prescribe medications that can increase dopamine activity in the brain. One category is dopamine agonists, which mimic the effects of dopamine. Another type of agent is levodopa, which is converted into dopamine in the brain. They each carry their own relative benefits and side effects. Researchers also have found strong links between schizophrenia and excessive amounts of dopamine in certain parts of the brain. Parkinson's Disease. National Institute of Health, Senior Aging website. Updated June, 2016. Thompson, R.F. The Brain: A Neuroscience Primer. New York: Worth Publishers; 2000.